Na Nach Nachma Nachman Meuman: B"H amazing advance of Hafatza by the Keren! B"H amazing advance of Hafatza by the Keren! Just now I spoke with Shay, the active manager of the Keren, who told me amazing progress the keren has made B"H. Amram Horowitz OBM, Saba's grandson and the head of the Keren, before he died (about 2 years ago) told Shay that they should shift their main focus of hafatza from Meron to the area of the Western Wall and the Old City of Jerusalem. B"H the Keren has a beautiful store in the Jewish Quarter of the Old City of Jerusalem, unfortunately the store was understaffed with Aaron Chay working double shifts as he maintained a job in a local makolet (mini mart) that overlooks the "square" of the Jewish Quarter. Rabbainu intervened and started to be mikarev (draw close) the owner of the makolet, who's been drawn to Uman twice already. So BH the makolet has employed Aron Chay to extend a point of hafatza from the makolet! 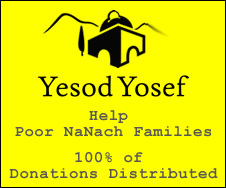 Moshe Lipon has taken over the Nanach store. There is amazing potential here B"H, and your prayers are needed to ward off the evil that is already seeking to disrupt. This is a great opportunity for anyone who is interested in helping with hafatza, to get over there and lend a hand to this growing conglomerate of Nanach. B"H Israel is seeing the most tourism ever, ranking in the highest of the world, and there are alot of people going through the old city, besides the huge amount of Israelis and school children that make their way there. So with two points of Hafatza there, we could use all hand on board! Great could I play guitar in front of the store? I sing only Na Nach songs and give out brochures I make myself! Thanks for keeping us informed .. my old stomping grounds..